2.1 Our Site is owned and operated by WEBDADI [, a limited company registered in England under company number 06650275, whose registered address is 7-8 Crescent Stables, 139 Upper Richmond Road Putney, London, SW15 2TN. 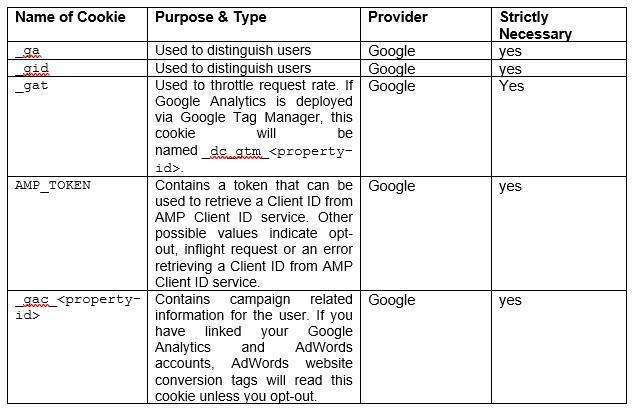 3.3 Cookies on Our Site are not permanent and will expire [after browser is closed ] OR [as indicated in the table below]. 4.2 Our website uses third party cookies. 4.3 Our Site uses analytics services provided by Google Analytics Website analytics refers to a set of tools used to collect and analyse anonymous usage information, enabling Us to better understand how Our Site is used. This, in turn, enables Us to improve Our Site and the [products] AND/OR [services] offered through it. You do not have to allow Us to use these Cookies, however whilst Our use of them does not pose any risk to your privacy or your safe use of Our Site, it does enable Us to continually improve Our Site, making it a better and more useful experience for you. 5.1 Before Cookies are placed on your computer or device, you will be shown a prompt requesting your consent to set those Cookies. By giving your consent to the placing of Cookies you are enabling Us to provide the best possible experience and service to you. You may, if you wish, deny consent to the placing of Cookies unless those Cookies are strictly necessary; however certain features of Our Site may not function fully or as intended. You will be given the opportunity to allow and/or deny different categories of Cookie that We use.